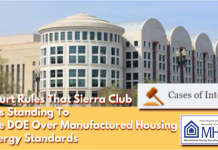 Washington, D.C., March 19, 2019 –The Manufactured Housing Association for Regulatory Reform (MHARR) has filed an analysis and comments (copy attached) with the federal Manufactured Housing Consensus Committee (MHCC) exposing a blatant whitewash of supposed manufactured housing energy regulation costs developed at the request of the MHCC by the Department of Housing and Urban Development’s Office of Policy Development and Research (PD&R). PD&R’s ostensible “analysis” of U.S. Department of Energy (DOE) cost/benefit data initially developed as part of a fundamentally tainted and contrivedDOE “negotiated rulemaking” process, not only fails to provide the independentfact-finding regarding the potentially enormous costs of proposed DOE manufactured housing energy standards sought by the MHCC, but constitutes a cover-up and attempt to legitimate, after-the-fact, a brazenly-contrived DOE rulemaking process (and related alleged cost-benefit inputs) that were rejectedby the Office of Management and Budget and its Office of Information and Regulatory Affairs (OIRA) not once, but twice. To the extent that DOE’s most recent regulatory proposals, contained in the August 2018 “Notice of Data Availability” (NODA) allegedly “analyzed” by PD&R, expressly rest-upon and are admittedly derived from those earlier illegitimate data inputs – thoroughly deconstructed and disproven by MHARR, the George Washington University Regulatory Studies Center and the U.S. Small Business Administration — there is absolutely no valid basis for the NODA proposals, and PD&R’s alleged “analysis” of that data is completely baseless and factually worthless. 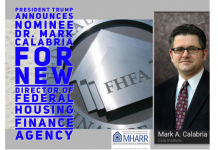 As a result, MHARR’s comments call for a completely newstandards development process for anynew manufactured housing energy standards, ifany such standards (which are unnecessary as shown by U.S. Census Bureau energy cost information) are, in fact, developed. At its September 11-13, 2018 meeting, the Manufactured Housing Consensus Committee (MHCC) reviewed a Notice of Data Availability (NODA) and related materials published by the U.S. Department of Energy (DOE) regarding proposed energy standards for federally-regulated manufactured homes.The NODA constitutes, by its own terms, a “re-evaluation” of DOE’s approach to manufactured housing energy regulation pursuant to section 413 of the Energy Independence and Security Act of 2007 (EISA) and a “re-examination”of the specific manufactured housing standards, methodologies and underlying data and analytics published by DOE as a proposed rule on June 17, 2016. Pursuant to this review, the MHCC adopted two resolutions — one objecting to the timing and substanceof the NODA, and seeking a re-delegation of the entire matter of manufactured housing energy standards back to HUD and the MHCCand a second resolution, requesting HUD PD&R to “submit a document to the MHCC which includes comparable cost figures similar to” the DOE NODA package draft results. Ostensibly in response to this request, HUD PD&R conveyed a cursory three-page memorandum to the Acting Administrator of the HUD Manufactured Housing Program on October 26, 2018.Inexplicably, this memorandum was not made available to MHCC members, interested parties, or the general public until late-January 2019. 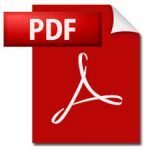 Without offering anyspecific analysis of DOE’s data or assumptions, or details of its own alleged review, the PD&R memorandum nevertheless posits two broad conclusions, stating: (1) that PD&R “does not object” to DOE’s “cost figures;”and (2) that PD&R “broadly speaking… does not object to the methodologies and assumptions used within DOE’s [life-cycle cost analysis] and annualized spreadsheets.”(Emphasis added). These conclusory assertions,however: (1) are not responsive or even relevantto the actual data and analysis requested by the MHCC; (2) rely on discredited, illegitimate alleged data and related analytics developed as part of the fundamentally-tainted, sham DOE 2014-2016 “negotiated rulemaking” process (see below); and (3) rely, in part, on assumptions that have since been repudiated by the Trump Administration.For all of these reasons, the October 26, 2018 PD&R “analysis” – like DOE’s NODA and June 17, 2016 proposed rule — is factually worthless and illegitimate, and, if anything, demonstrates that any additional manufactured housing energy standards, if pursued at all,must be the subject of an entirely new, legitimate and fully-transparent rulemaking process. Instead of “starting-over” with a completely new, legitimate rulemaking and standards development process, however – as shown by multiple documents disclosed by DOE pursuant to the Freedom of Information Act (FOIA) — DOE, with the support of the Manufactured Housing Institute (MHI)and multiple allied energy special interests,instead orchestrated a highly-truncated, non-substantive, sham “negotiated rulemaking” process to serve as a fig-leaf to satisfy OIRA while simultaneously continuing to pursue the “impermissibly disclosed” 2011 “draft” manufactured housing energy standards rule already developed by DOE. Toward this end, former MHI Regulatory Affairs Vice President Lois Starkey, on March 14, 2014, wrote to DOE, seeking to revive the then-moribund DOE manufactured housing rulemaking process via a negotiated rulemaking with “a tight meeting schedule” and “a minimum of meetings” (emphasis added) – notwithstanding the complex, highly-technical and price-sensitive nature of the subject matter involved, based on the previously “impermissibly distributed” 2011 “draft NOPR and Technical Support Documents for opening discussion” – i.e., in order to facilitate a whitewashof the 2011 “draft” DOE rule and appearto “begin the [regulatory] process anew,” as directed by OIRA, while, in fact, doing no such thing. Robin Roy: “Short. 2 meetings would be great. But we won’t be specific in the letter.”(Emphasis added). Subsequently, in a May 28, 2014 letter to DOE, MHI, NRDC and other energy special interests again sought a negotiated rulemaking based on “a tight meeting schedule with a minimum of meetings, e.g., 2 two-day meetings” utilizing the 2011 “draft NOPR and Technical Support Documents” as the basis for further discussion. (Emphasis added). These exchanges resulted in a rushed, truncated and superficial process utilizing a “negotiating” Working Group comprised almost entirely of energy special interests and other intra-industry supporters of DOE energy regulation, including alleged manufactured housing energy “experts” which – as disclosed through FOIA document requests – had previously been paid millions of dollars by DOE for supposed “research” contracts.Cost estimates for the proposed standards, moreover, were developed behind closed doors by a Working Group contractor, based on an undisclosed survey of unidentified manufactured housing producers selected by MHI and conducted in secret, with no indication that any smaller manufacturers were surveyed. 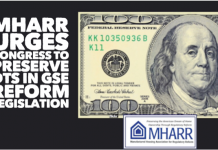 Indeed, open cost figures developed by MHARR manufacturers show a retail cost impact of nearly $6,000.00 for the Term Sheet-based standards, while DOE posited cost impacts of slightly more than $2,000.00 in its initial June 17, 2016 NOPR. Not surprisingly, given that the DOE rulemaking process was entirely contrived, the final “Term Sheet” assembled by the Working Group was approved with MHARR casting the onlynegative vote. This huge cost discrepancy, however — which is highly relevant to lower and moderate-income consumers within the largely price-inelastic manufactured housing market — is totally ignored by PD&R in its October 26, 2018 memorandum. While the June 17, 2016 DOE proposed rule – derived from the tainted Working Group Term Sheet — was subsequently rejected once againby OIRA and withdrawn, as a result, by DOE in January 2017,the 2018 NODA, as it expressly acknowledges, is based on the alleged cost “information” developed by the fundamentally illegitimate “negotiated rulemaking” Working Group.Thus, the 2018 NODA derives from and is itself an ultimate product of the fatally-tainted and illegitimate DOE “negotiated rulemaking” process. By referring this matter to HUD PD&R for supposed “analysis,” however, the MHCC has inadvertently invited yet another “whitewash” of this matter, insofar as the so-called PD&R “analysis” is non-responsive to the MHCC’s actual inquiry, is based on a non-transparent methods, assumptions, methodologies and inputs that cannot be legitimately evaluated, and ignores OIRA’s repeated rejection of underlying DOE proposals and the supposed justifications and bases for those proposals. 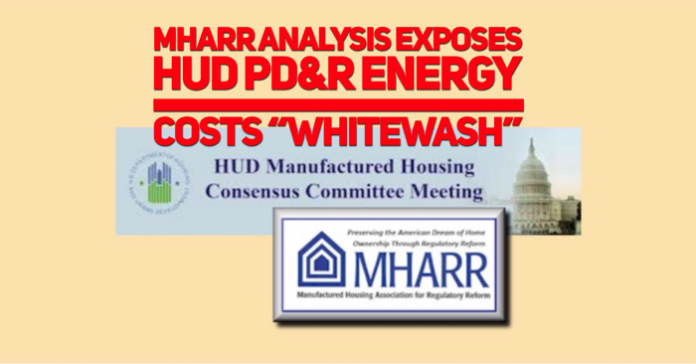 Moreover, given HUD PD&R’s own history of political bias in favor of – and as an enablerof — greater and more costly federal manufactured housing regulation (before being curbed to some degree by MHARR), any analysis produced by PD&R is inherently suspect. The MHCC, in its September 11, 2018 resolution, specifically requested that HUD PD&R develop, and submit to the MHCC, a document including “comparable cost figures, similar to” the DOE NODA package draft results. (Emphasis added). The October 26, 2018 PD&R memorandum, however, does no such thing. Instead, without anyindependent data, transparent, publicly reproducible (or reproduced) analysis, disclosure of sources, methods and inputs, or, apparently, consideration or even recognitionof the multiple fatal flaws in the alleged data inputs to the tainted and illegitimate DOE “negotiated rulemaking” process identified by MHARR in written comments in the DOE public rulemaking docket, the October 26, 2018 memorandum summarily concludes with the opinionthat PD&R “concurs with DOE NODA’s “methodology and resulting cost figures.”There is, however, no valid, legitimate, or credible basis offered for that opinion, meaning that the PD&R memorandum not only failsto deliver the independent information requested by the MHCC, but instead illegitimately seeks to buttress the unreliable, unreproducibleand ultimately invalid alleged “data” underlying both the June 17, 2016 DOE proposed manufactured housing energy rule andthe 2018 DOE NODA. As such, the October 26, 2018 PD&R memorandum is not only factually worthless for purposes of MHCC review, but affirmatively misleading. First, the MHCC did not request or seek a simplistic, conclusory three-page opinion piece affirming alleged DOE data that MHARR, in previous DOE comments, has already shown is baseless – both under-representing the consumer-level cost of the June 17, 2016 DOE proposed rule and, by necessary implication, the 2018 DOE NODA proposals, while simultaneously over-stating the alleged benefits of both proposals. Instead, the MHCC sought and requested independent data and related analysis from PD&R, which was not provided. If PD&R required additional time to perform the functions assigned to it by the MHCC, it should have sought that time, rather than produce and offer to the MHCC a warmed-over rehash of the same illegitimate alleged “data” and “analysis” already produced by DOE. Second, PD&R states that it “contacted multiple individuals with expertise in manufactured housing related-energy matters.”PD&R, however, does not disclose who those “individuals” are, what their qualifications may be, which specific “matters” were addressed, what their business and/or organizational affiliations are, whether they are part of or represent a special interest or special interest group, or whether any of those alleged “individuals” represent smaller industry businesses. One relevant question regarding the “individuals” contacted by HUD PD&R, however, doeshave a clear and unequivocal answer that is discernible on the public record. HUD PD&R did notbother contacting the one organization representing smaller, independent industry businesses that voted againstthe recommendations of the DOE Manufactured Housing Working Group (MHWG) and aggressively opposed both the June 17, 2016 DOE proposed rule and the 2018 NODA – i.e., MHARR. This begs the question whether PD&R’s undisclosed alleged inputs were solicited and received solely from proponents of – and active participants in – the sham, contrived “negotiated rulemaking.” Regardless, though, without transparent, legitimate data and/or factual inputs, the PD&R report is unverifiable and useless. “’As an initial matter, the threshold inquiry posed by DOE in the August 3, 2018 NODA, is ‘What analytical aspects related to DOE’s June 2016 proposal … should DOE consider re-examining as part of its of its ongoing consideration of a final rule for manufactured housing?’ *** MHARR’s simple and straightforward response to this threshold inquiry is that allof the ‘assumptions,’ data and alleged factual predicate underlying the June 2016 proposed rule should not only be ‘re-examined, but should be expressly rejectedby DOE, withdrawn, and replaced with valid, legitimate and transparent data developed by and through a valid, legitimate and transparent process. This is particularly the case insofar as DOE’s 2016 draft final rule — based on the June 2016 proposed rule and the “negotiated rulemaking” process which led to that draft final rule – did ‘not clear’ regulatory review by the OMB Office of Information and Regulatory Affairs and was withdrawn as a result. “[E]ven if the alleged DOE ‘negotiated rulemaking’ in this matter were not fundamentally and irretrievably tainted – which it was – the data, information and ‘assumptions’ underlying that proceeding, its final Term Sheet and, ultimately, the June 2016 DOE proposed rule, were not produced, obtained or developed pursuant to an open or “transparent” process within the meaning of [Executive Order] EO 13777. Specifically, cost information inputs (apparently still being utilized by DOE in calculating the cost of its proposed energy “packages”) were provided to DOE by the Manufactured Housing Institute (MHI) — through a now-former Vice President who was a member of the “negotiated rulemaking” Manufactured Housing Working Group (MHWG) — without those cost inputs, or their source, or derivation, being disclosed either to other MHWG members, to the Manufactured Housing Consensus Committee (MHCC), or to the public. To the contrary, requests for the full disclosure of such information by MHARR’s representative to the MHWG were specifically denied. PD&R’s alleged analysis of the “data” relied-upon by DOE in its 2018 NODA, accordingly, is irrelevant, as is the alleged “data” itself. Insofar as that “data” was developed as part of an illegitimate, contrived DOE “negotiated rulemaking” process, allof that alleged “data” should be discarded and repudiated by DOE, thereby making any analysis of that “data” by HUD PD&R superfluous. Furthermore, even if the alleged “data” inputs to the DOE “negotiated rulemaking” process and 2018 NODA were not inherently unreliable and part of a sham process, the cost-benefit calculations underlying the June 17, 2016 DOE proposed rule and, by necessary implication, the 2018 NODA, were based, in part, on a “Social Cost of Carbon” construct that was subsequently withdrawn by the Trump Administration. As MHARR previously noted in July 14, 2017 comments to DOE in response to its May 30, 2017 Request for Information seeking public comment pursuant to EO 13777 and EO 13771 (“Reducing Regulation and Controlling Regulatory Costs”) on DOE rules that are “outdated, ineffective, or excessively burdensome,” the June 17, 2016 DOE proposed rule was based, in substantial part, on cost-benefit information derived from the Obama Administration’s so-called “Social Cost of Carbon” (SCC) construct. The SCC construct relied-upon by DOE, however, was later repealed by the Trump Administration through Executive Order 13783 (“Promoting Energy Independence and Economic Growth”), issued on March 28, 2017, which stated that the SCC was being “withdrawn as no longer representative of [federal] government policy.” Given this action, the June 2016 proposed DOE rule, which substantially relies on alleged consumer “benefit” information derived from the SCC, violates Section 3(d)(vi) of EO 13777, which provides for the repeal, replacement, or modification of regulations that “derive from or implement Executive Orders or other presidential directives that have been subsequently rescinded….” And, given the fact that the 2018 DOE NODA Packages – Draft Results document, by express acknowledgment, is premised upon “incremental costs and savings calculations … based on methods and data presented in the [June] 2016 NOPR,” those calculations – and the resulting NODA “packages” — likewise contradict and violate EO 13777, and should be rejected. For all of the foregoing reasons, the MHCC should reject HUD’s October 26, 2018 alleged “analysis” of the DOE NODA, and should reiterate its rejection of both the NODA and the entire DOE process underlying the NODA and the June 17, 2016 DOE proposed rule for manufactured housing energy standards and should further: (1) continue to seek and recommend the re-delegation of manufactured housing energy regulation back to HUD; and (2) if any new manufactured housing energy standards are deemed necessary, ensure an entirely new and legitimate rulemaking process which ensures accurate factual inputs and complete transparency. See, 83 Federal Register, No. 150, August 3, 2018, pp. 38073-38080, Notice of Data Availability; Request for Information and related materials, attached hereto as Exhibit 1. Inexplicably, the full text of this resolution, quoted by MHARR in its contemporaneous written report on the MHCC meeting (see, September 19, 2018 MHARR Washington Update at p. 4), is not included in the “draft” minutes of the meeting – an issue that MHARR intends to address at the upcoming April 30 – May 2, 2019 MHCC meeting. See, Draft MHCC September 11-13, 2018 Meeting Minutes at pp. 7-8. See, Exhibit 2, attached hereto. Trump Administration Executive Order 13777 (“Enforcing the Regulatory Reform Agenda”) specifically targets for reconsideration and repeal, “regulations that rely in whole or in part on data, information, or methods that are not publicly available or that are insufficiently transparentto meet the standard for reproducibility….” (Emphasis added). See, 82 Federal Register, No. 82, March 1, 2017 at p. 12286. See, Section III C, infra. 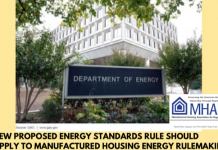 Consistent with the MHCC’s resolution calling on DOE to re-delegate this entire matter to HUD, there is no valid or legitimate basis for the imposition of punitive and discriminatory energy standards on federally-regulated manufactured homes. HUD Code manufactured homes, as demonstrated by MHARR in its August 8, 2016 written comments on DOE’s June 17, 2016 proposed rule and its September 17, 2018 NODA comments (attached hereto as Exhibit 3), are already energy efficient, as demonstrated by U.S. Census Bureau data. See, Exhibit 4, attached hereto – Transcript of August 5, 2014 exchange within the DOE Manufactured Housing Working Group. A representative of the industry’s largest businesses, with the ability to absorb greater, more costly and unnecessary regulation. See, Exhibit 5, attached hereto. See, Exhibit 6, attached hereto. See, Exhibit 7, attached hereto. See, Exhibit 4, attached hereto. It is important to note again that the DOE NODA Packages – Draft Results document which is the subject of PD&R’s purported “analysis,” specifically states that its “incremental costs and savings calculations are based on methods and data presented in the [DOE August] 2016 [Notice of Proposed rulemaking.” As a result, the 2016 NODA, and its related cost-benefit calculations were based on the same alleged “data” developed as part of the fundamentally-tainted 2014-2016 DOE “negotiated rulemaking” process. See, Exhibit 2, supra, at p. 3: “PD&R staff was not able to recreate the survey conducted by the [DOE Manufactured Housing] Working Group given the short timeframe provided by the MHCC.” The excuse cited by PD&R, however, is irrelevant and not a valid, lawful, or legitimate basis for proffering an uninformed, factually-vacant opinion on a fundamentally tainted DOE process, based on a warmed-over rehash of the same illegitimate, contrived alleged “data” assembled by DOE. See, Exhibit 2, hereto, at p. 2.